Its red wood base and durable cast iron construction emit the flavor of charming antique. 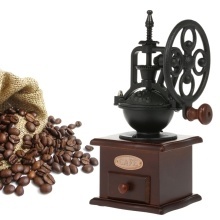 Perfect for coffee shop display, as a birthday gift, or simply for grinding coffee beans. The manual coffee bean grinder with built-in polygon adjustor (turn it upward or downward) enables you to precisely control over the powder fineness for any desired brewing method. This hand-crank style mill requires just a few turns on the handle to grind coffee beans, spices, nuts, herbs or other gourmet ingredients. No batteries or electricity is required. The hand crank grinder with ceramic grinding core, can be washed easily, no metal smell, avoid raw heat affecting flavor. Pure wood bottom base with drawer collects powder easily. You&apos;ll never deal with jumping beans or messy dust again. Don&apos;t bother with messy, complicated grinders. An ideal companion for Coffee Maker, Espresso Maker & Other Home Brewing Systems. 1. The measurement allowed error is +/- 1-3cm. 2. Wood product should not be washed with water. 3. The handle should not be rotate counterclockwise to avoid damaging the ceramic core. 4. Normally it only takes 2-3 minutes to complete the grinding process.